Today’s “Young Guns” segment features Garrett Beck, a young man whom we have gotten to know through our travels. 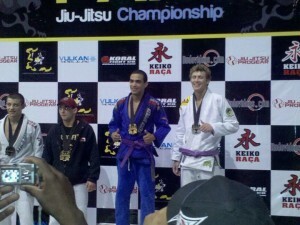 Garrett is a Robert Drysdale JJ/Fairfax JJ representative and a purple belt under Abmar Barbosa. Some of his wins includes the 2010 Pans (2nd place – featherweight) and the 2010 New York Open (3rd place – featherweight and 2nd place – Absolute). Standing at six feet three inch, this featherweight is a formidable opponent for anyone in any weight division. 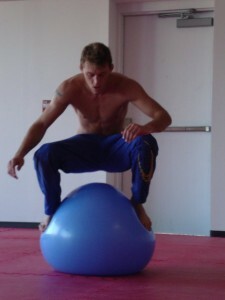 Watch for this “Young Gun” to shake up the purple belt division in 2012. How did you start Brazilian Jiu Jitsu? I was actually introduced to BJJ in 1994 by my good friend Justin Lough who I have known my whole life. He had picked up some basic positions and submissions from a friend of his family. There were no academies around then so we would just practice with each other and think we were cool like kids usually do. That year he moved to Georgia for a while and we kind of forgot about it. Flash forward to 2006 we are hanging out and he asks if I want to try a class of that BJJ we had done as kids. I said sure and have been doing it ever since. How did you end up with Abmar Barbosa? Abmar came to do one of his first seminars for Yamasaki academy back when he was a purple belt. He visited each academy to let everyone at Yamasaki know he was there. So one day he comes to Dave Jacobs academy and everybody rolled with him a few times. My first time rolling with Abmar he put his feet in my hips, lifted me up and played airplane with me, then spun me into an armlock. I was amazed. Abmar didn’t speak English and Justin and I did not speak Portuguese but somehow we became friends. Every time he came back we would all hang out and eventually Abmar invited us to Brazil to train with him, Justin went in 2007 and I went in 2008. What was your first day of BJJ at Fairfax Jiu Jitsu? In June 2006 I went into my first class of BJJ thinking much the same thing as many other people do. “I’m in good shape, I know how to do an armbar, I’m gonna crush everyone here”….. And needless to say I did. Stories have been told of the destruction I caused on the mat that day… That’s what I like to say, but of course I was tired after my first round and got tapped more than a bongo. I couldn’t roll on my shoulders during drills or do the technique right. But Dave was real welcoming and made me feel ok about having my pride taken away from me. I was addicted after my first class and have been training as much as possible ever since. What is like training with Robert Drydale? Training with Robert is awesome. He has a different perspective on Jiu Jitsu that is really nice to hear and his techniques are always great. Robert was nice enough to let me stay with him for a little while before Pan ams and in that time I got to see how good of a coach he is and how much effort he puts into his students. All his guys are top notch and I can see why so many professional fighters come to train with him. For most people in the BJJ community, it’s a rare opportunity to be the right hand man of a world champion, what is that like? I don’t know why or how but for some reason Abmar likes me. All I do is cause problems and stress for him, but he keeps me around. The more I think about it the more I feel like maybe he has been trying to get rid of me, but I just keep following him around. He goes to Brazil I go too. He comes to D.C., I follow. He opens an academy in MA, and I’m there. Com es to VA and I’m with him. I’m lucky to have the opportunity to see how a world champion trains and lives. I don’t have enough room to tell all the things he has done for me, and I try to help him out in any way I can. He treats me like his brother and I think of him as the same. You were the co-star of Abmar’s Barbosa’s Outlaw DVD Series, what was that like? I feel like I was a big part of that DVD. I didn’t do any techniques or commentary but there were a lot of little subtle things I did that I think made a real impact. Occasionally I would look directly at the camera during a sweep and convey the panic that I was feeling as I lost my balance with no hope of recovering, or I would let my arm snap during an arm lock just to show that it worked. And I won’t even get into the fact that thanks to a fresh shave, my boyish good looks attributed to 90% of female sales… Actually it was a lot harder than I thought it would be. Abmar and the guys at Digitsu put in a lot of work on that DVD and I was just happy to be a part of it. I have kind of a strange game. Abmar is a big proponent of making your own Jiu Jitsu and not emulating another person’s game. That being said, whether I want to or not I still do a lot of the same things he does. Probably due to me being on the receiving end of them so often and seeing how well they work. I also feel like I fight well from bad positions. Most likely because I always weighed less than all my training partners I got used to being put in bad spots and a lot of my game is turning those into a good position. I’m not even sure what kind of game I like, I used to only play guard, but have started to like passing more (I guess something about not having someone smashing down on you the whole time is appealing). I guess I would describe my style as a work in progress. I am finding new things I like to do and incorporate regularly and hopefully that never changes. What has been your proudest moment in BJJ thus far? Every time I compete becomes my proudest moment. When I step on the mat at a competition I realize that I am still doing what I love to do and still on the right track to accomplish my goals. I am extremely proud of that. Losing to a guy who is better than me doesn’t feel too good, but if I lose because I was unprepared or I gave up, that is the worst feeling in the world. I try to fight at my best and remember that at every competition. If I lose to you I just need to get better at Jiu Jitsu, that’s easy. If I lose to myself then I have a real problem. I’ll be at the Pans and Worlds and World Pro trials this year so hopefully you will be seeing a lot of me!